Windows 10 Version 1607 of development branch RS1 (RedStone 1) has reached final RTM milestone at build 14393, and has been released to Windows Insiders since mid July 2016. On August 2nd, 2016, Windows 10 Anniversary Update, which updates all Windows 10 systems to version 1607, starts rolling out to all users. Microsoft will automatically push Windows 10 Anniversary Update to all Windows 10 systems through Windows Update in waves, so everyone will get it sooner or later. But if your Windows 10 system’s Windows Update hasn’t shown Windows 10 Anniversary Update yet, you can try to manually trigger the download and installation of Windows 10 Anniversary Update, through the following methods. Click or tap on Check for updates. 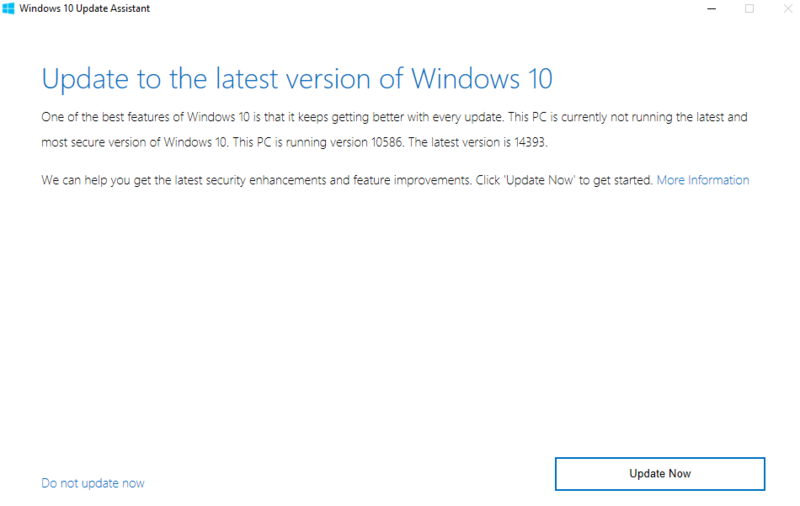 Windows 10 should offers an update called “Feature update to Windows 10, version 1607”, the name for Windows 10 Anniversary Update, from which you can download and start upgrading your PC to Windows 10 Version 1607. 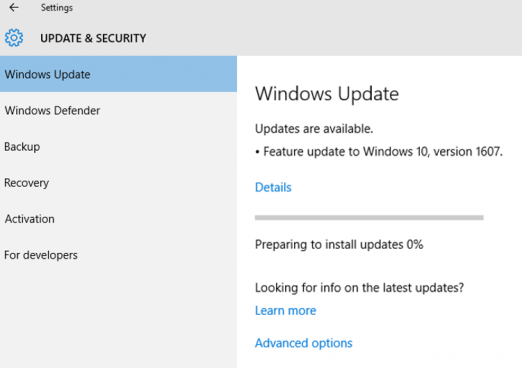 Windows 10 Upgrade Assistant or Windows 10 Update Assistant can check the version of Windows 10 currently running on the PC, and offers user an option to upgrade if newer version if found. If Windows Update stubbornly refused to offer Windows 10 Anniversary Update, download the Media Creation Tool to force an upgrade. You can use the Media Creation Tool to start the upgrading process directly, or create an installation media in ISO format, DVD or USB flash drive. The installation media allows user to clean install instead of upgrading. The complete images of Windows 10 Version 1607 Build 14373 ISO are available for download through a little trick. You can then mount the Windows 10 ISO and run the setup.exe to start the upgrade process, or clean install. Windows Insiders have early access to latest builds of Windows 10. In fact, Windows 10 Anniversary Update has been rolled out to Windows Insiders for some time. Enrolling in Windows Insider Program will allow you to get the latest available builds of Windows 10, i.e. Windows 10 Version 1607 Build 14393, together with various cumulative updates for it as soon as they’re released. However, as Windows Insiders are also getting most updates through Windows Update, and for new Windows Insiders, it may take a while for enrollment to activate, thus this method doesn’t really speed up the availability of Windows 10 Anniversary Update to your system.